Mr Lee's Painting Emporium: Fallen Frontier model review! So this is a pretty cool little surprise to show off here on the old blog! As I am trying to make Tuesdays into my Review days.. today I have a super cool review to show off! 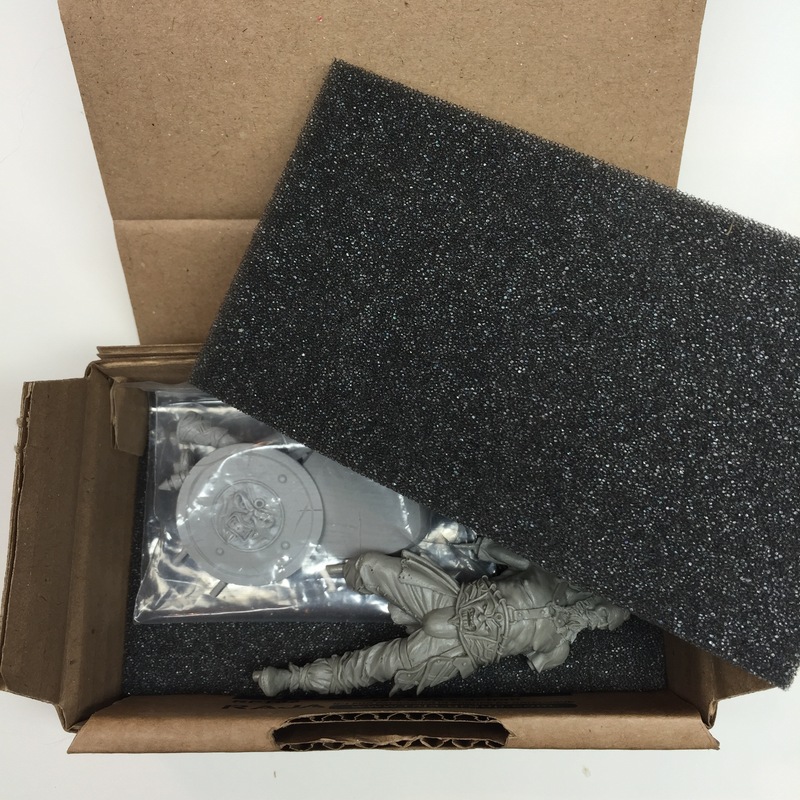 If you haven't noticed from the photo above, those are Berzerker models from the Fallen Frontier kickstarter that is happening right now! Well I have been in chats with Elias from their project team for a while now, seeing how it all goes and whats happening with the project. I have always liked these models from their range. So dynamic, full of character, and just screams action! In a recent chat with him, he asked if I would like to have a few to check out and review from a gaming/painter side of things! So after a stint with the post service, I have now in my possession 2 of the Berzerker models! A regular trooper, and the Special Character Sihlas Fenn! Right away I am blown away with the quality! This is not a regular quality table top model here. This is proper resin, that is crisp, and hard. Nothing flimsy about these, and they will stand up to some serious gaming easily! There is a bit of flash, and the odd mold line on them. I would be lying to say there wasn't. Though most are in places that you cannot immediately see or will be hidden once they are assembled. Such as ball socket area of the torso. Or at the end of one of the arms. A bit can be seen under the arms as well, but simple enough to scrape that away with a hobby knife. But the main sections.. the faces and hands... perfect! Nothing needed to be done here for it at all!Well.. nothing except to paint it up! I couldn't resist but to build Fenn up with blutac to keep him together. He is a bit difficult to photograph here though due to the dynamic pose that he holds! Just too much details for the poor old camera to grab from him! But you can see that there is almost zero issues with him here, and very minor flash on him. Oh and where some of them look like mold lines ( like on his left arm ) is actually veins! Yeah.. those guys are crazy with regards to how they are adding details to these modes for gaming purposes! I can say that these guys will be painted up to showcase level for myself at some point and put on a nice socket at some point. Why not really when I can pick up more of them in the kickstarter for proper gaming purposes as well! So yeah.. get on over to Kickstarter and give this project your backing! Not to be missed, and going to be quite the material to work with! Possibly a game changer for a lot of people out there! I was sooo excited for the review...any my best expectations were not dissapointed. Where can I buy these Berserkers? These were part of the Fallen Frontier kickstarter that just ended. I was given one in advance to do a quick review of it and give my opinion of the pieces. Mr Lee's Year, 2014, in review! Review: Romeo Bust Oin "Mordiroccia"
Review: Reaper Bust "The Grudge"
Star Wars X-Wing game board! Portal Paint off! Round 1!